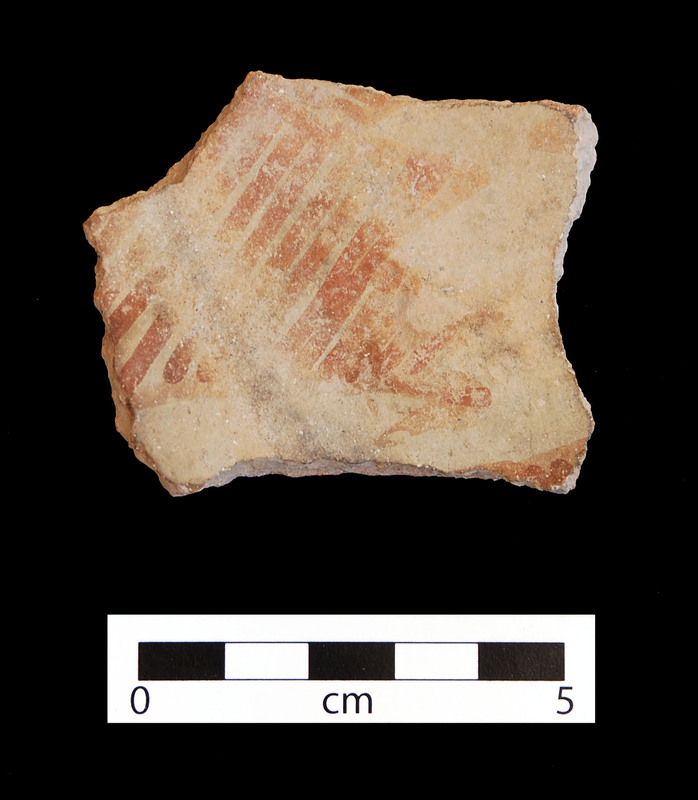 Snaketown Red-on- buff sherd. Click the image to open the Snaketown Red-on-buff gallery. Snaketown Red-on-buff is the type of Hohokam Buff Ware that transitioned between the earlier gray finishes to the buff colored pottery characteristic of later types. 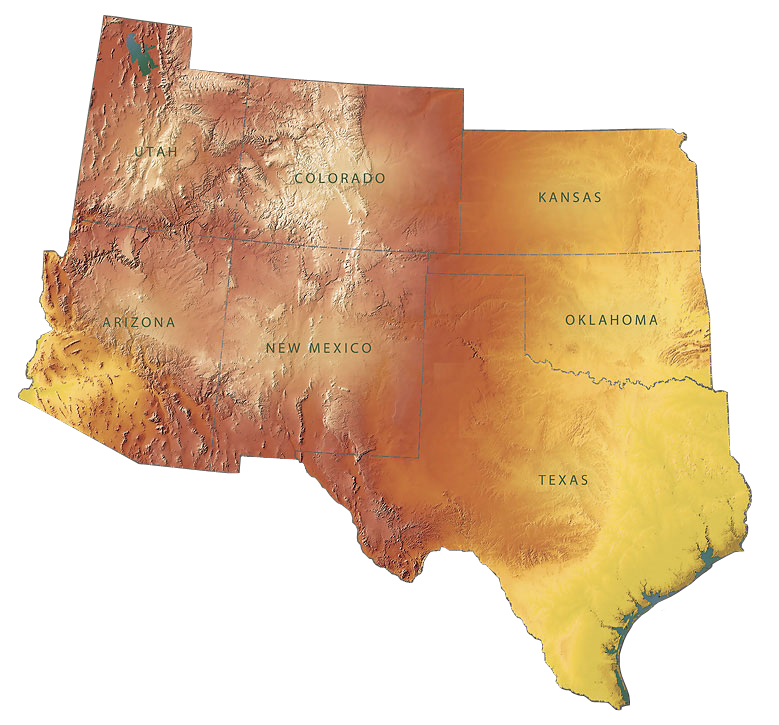 Production of this type was primarily in the middle Gila River Valley and in Queen Creek, but extended south to the Tucson area, where local production also occurred (Snaketown Red-on-brown). Date Range: ca. A.D. 650-725 (Early), A.D. 725-750 (Late). Firing: In a neutral to oxidizing atmosphere. Surface Finish: Hand smoothed and tool polished; sometimes sooted; unslipped (Early) or slipped with a buff wash (Late); usually non-porous; visible mica. Paste Color: Dark gray to tan; surface color typically light brown, gray-brown, or gray. Forms: Bowls predominate, some with flared rims; jars; censers; scoops; dippers; few effigies. Design: Large hachure-filled designs, including serrated or stepped scrolls, keys, triangles pendant from the rim; thick serrated lines; paint on bowl exteriors often covers most of the surface; trailing lines. Layouts are banded, sectioned, and all-over (checkerboard). Incising: Shallow incising parallel to the rim; often discontinuous; no complicated patterns. Key Traits: Early: Hachure-filled designs with less than 10 percent of lines touching; thickest line less than 2.5 mm; gray paste; no slip; polished surface. Late: Slipped; hatchure-filled designs; shallow incising. Other Names: Early: Snaketown Red-on-gray or Early Snaketown Red-on-buff; Late: Late Snaketown Red-on-buff, Snaketown Red-on-brown (locally produced in the Tucson area). Comparisons: Earlier types lack slip and have deeper, more regular incising, less complex painted designs, and thick lines; later types generally slipped and fired under more controlled conditions. Hatchure and curvilinear designs distinguish Snaketown Red-on-buff from other contemporaneous types. Deaver, William L. and Cioleck-Torrello, Richard S. (1995) Early Formative Period Chronology for the Tucson Basin. Kiva60(4):481-529. Heckman, Robert A., Barbara K. Montgomery, and Stephanie M. Whittlesey (2000) Prehistoric Painted Pottery of Southeastern Arizona. Technical Series 77. Statistical Research, Inc. Tucson.